In a mixing bowl place the mince and all the other ingredients for the meatballs. Using your hands mix it all together thoroughly. Once everything is combined make 14 medium size balls. Use a little oil in a pan and brown your meatballs on a medium heat. Once they are brown place them on a plate and set aside. Place the onions into the same pan and cook for 5 minutes until soft. Use a little water to deglaze the pan if need be. Add the garlic and cook for another 1-2 minutes. Add both paprikas along with the oxo cubes and then add the water, giving it all a good stir. Add the tinned tomatoes, tomato purée and bay leaves, season with salt and pepper. Stir well and bring to the simmer. Add your meatballs to the mixture and turn the heat right down. Cover with a lid. Cut all three peppers in to 3cm shapes and add to your mixture. Simmer with the lid for 20-30 minutes or until your peppers are slightly soft but still have a bite to them. While your goulash is simmering cut a round hole out of the centre of you bread rolls. Remove most of the bread from inside and then press down what's left to compact it and prevent the sauce soaking through. 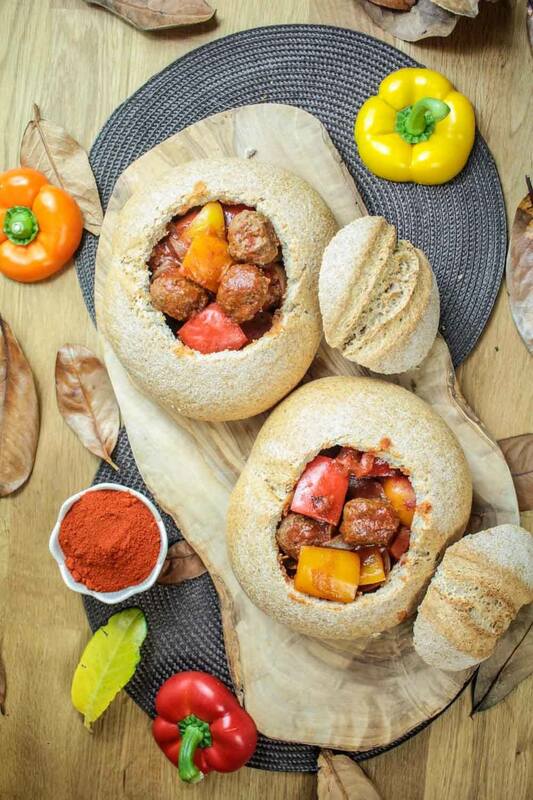 Ladle your goulash into the bread bowl, filling it as full as you like. You might want to keep anything that's left over in the middle of the table and break your bread bowl up to mop it up. Enjoy!